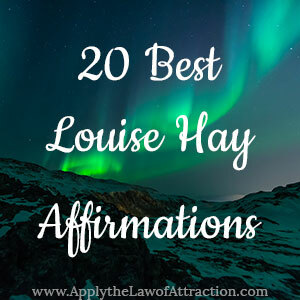 If you haven't comes across Louise Hay's amazing affirmations, you're missing out! Louise Hay isn't just a New York Times best-selling author with over 50 million books sold. She isn't just a friend of Oprah and Abraham-Hicks. She's more than the founder of Hay House publishing. Louise Hay has taught the power of affirmations for more than 25 years. She has used affirmations to heal herself of cancer, to heal from abuse, and to transform her life into one of great success and prosperity. Louise considers every thought we think, every word we speak to be an affirmation. Yes, even those little self-criticisms and complaints about your boss are affirmations in her book. We unconsciously go through our lives repeating these negative thoughts and words, creating more negatives in our lives. to create delightful things in our lives. Louise advises using affirmations for 30 days in a row, until they become a part of us. 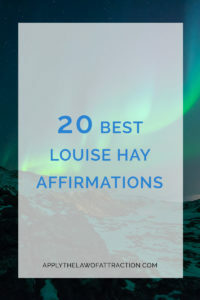 Here are the 20 best Louise Hay affirmations to help you change your life for the better. My good is constantly coming to me, so I relax and enjoy my life. I choose thoughts that make me feel loved and supported. I trust the Universe to take care of me. I now create a wonderful new relationship. I choose to open up and let the love in. I listen to my body and give it what it needs on every level to bring it back to optimal health. As I move through the layers of other people's opinions and beliefs, I see within myself a magnificent being, wise, and beautiful. I love what I see in me. I release all resistance to money, and I now allow it to flow joyously into my life. This is a day of delightful surprises. I eagerly await each moment. I am a Divine, Magnificent Expression of Life, and I deserve the very best. I accept this for myself now. I accept miracles. I accept healing. I accept wholeness. And most of all, I accept myself. It is only a thought, and a thought can be changed. I act as if I already have what I want – it's an excellent way to attract happiness in my life. I am willing to see my magnificence. I let go of all fear and doubt, and life becomes simple and easy for me. My self-esteem is high because I honor who I am. I am gentle with myself, knowing I am doing the best I can with the knowledge and understanding I have. Housework is fun. I always have the time to freshen up my home. I love doing simple household chores. I now deserve love, romance and joy – and all the good that life has to offer me. I hope you enjoyed these affirmations from Louise Hay as much as I do. They are powerful thoughts that can help you heal your life, making it the life you want to create. When saying affirmations, can i say them in English instead of in my own language? Try it and see if it works. If it doesn’t, use your own language.